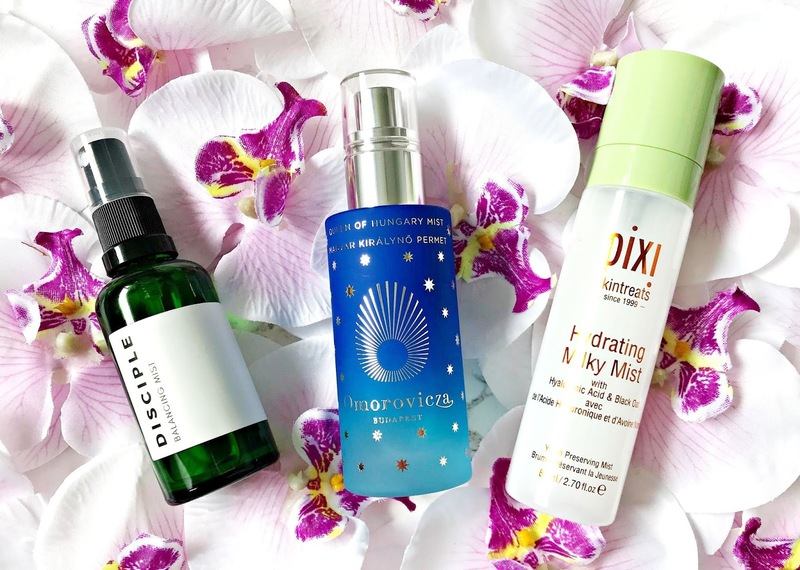 I love using face mists all year round but they're particularly beneficial in summer. I don't mean water sprays, I only use mists that will actually do something for my skin. I like to use them as part of my skincare routine, on flights, to refresh my makeup during the day and to hydrate on the go. I have three that I am using on rotation at the moment that I want to share with you today. Disciple Balancing Mist: I love the simple packaging of Disciple products, which is a brand that I was introduced to last month. This mist is definitely more than just a water - it contains geranium and copper peptides, both of which reduce inflammation and encourage dry skin to boost oil secretion, whilst at the same time, balancing oil patches of combination skin. I can only personally speak of the results on dry skin and they have been very positive - my skin instantly feels less tight and more hydrated when I use this as part of my skincare routine. The gentle floral scent is very calming and whilst the spray isn't the finest, it doesn't really matter when it's being used in skincare rather than over makeup. It's also great value at £12. Omorovicza Queen Of Hungary Mist: I have used so many bottles of this mist - it has the finest spray of all that I have tried over the years. The name alone makes this special and I adore the limited edition packaging but it's what inside that counts. It doesn't contain any alcohol so there's no risk of it drying the skin out and I find that it instantly calms my skin (as all Omorovicza products do). Because the spray is so fine, I find this mist is ideal for using throughout the day to refresh my makeup or just freshen up in general but it's also perfect to use after acid toning to balance the skin. It's available in 30, 50 and 100ml bottles. Pixi Hydrating Milky Mist: The spray on this mist isn't very fine but I can forgive that because it hydrates the skin so well. After cleansing and exfoliating, I spray this and can instantly see and feel the difference. It is packed with hyaluronic acid, which attracts and retains moisture in the skin and linoleic acid, which calms and soothes skin. An instant hydration fix and at a great price of £18. Do you like facial mists? What's your favourite one? All products are bought by me, unless otherwise stated. The Disciple & Omorovicza products were kindly sent to me. Opinion is always my own.